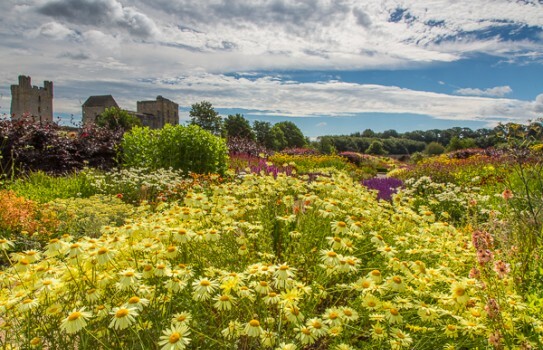 Built in 1759, Helmsley Walled Garden is a beautiful five acre garden sitting beneath the imposing ruins of Helmsley Castle. Built in 1759, Helmsley Walled Garden's five acres sit beneath the imposing ruins of Helmsley Castle. The garden provided the vegetables, fruit and flowers for the table of Duncombe Park until just after World War 1. Abandoned after it closed its doors for the final time in 1984, it fell into dereliction. Restoration started in 1994 and visitors can now enjoy restored glasshouses full of colour, a double herbaceous Hot Border running the length of the Garden or simply sit and enjoy the tranquillity of the Garden of Contemplation. A Clematis Garden showcases over 100 different clematis varieties and in the vegetable patch, and our Kitchen Garden provides vegetables and fruit for the kitchens of The Vine House Café. Visitors sit beneath Victorian vine cultivars to enjoy soups, salads and open sandwiches as well as delicious cakes and desserts. The Garden also works as a social enterprise, providing social and therapeutic horticulture to people with a wide range of difficulties and disabilities. 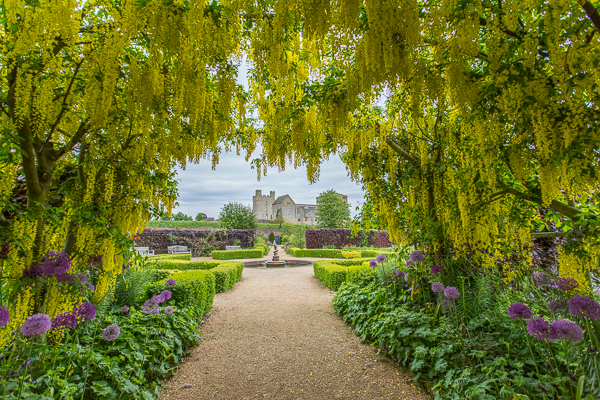 2019 Helmsley Walled Garden - normally open end of March to end of October please see website for more information. Plant centre, Gift Shop, Vinehouse Café. There is full wheelchair access to the Garden as well as the Café. Toilets and disabled toilets available. Dogs are welcome on leads. If you want to take a break near Helmsley Walled Garden, why not stay in one of our recommended hotels. Look now - click here.